The Christian & Missionary Alliance (C&MA) established it’s first work in Mitchell County at the Burr Oak School in 1926 by Rev. Joe Rostad. 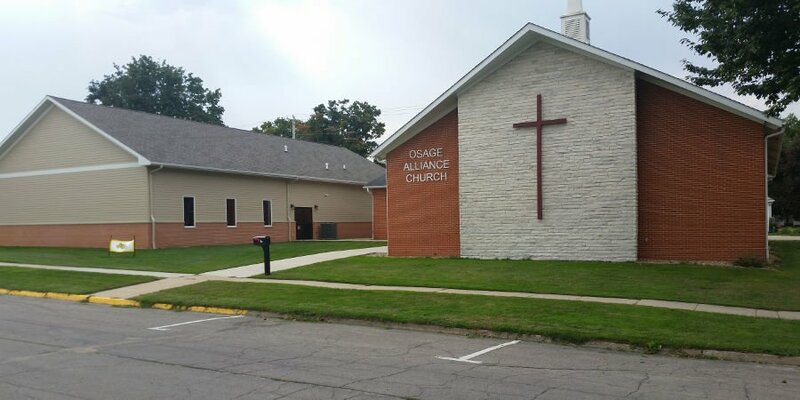 As a result of the merger of three C&MA chapels, the Osage Christian and Missionary Alliance Church (Osage Alliance Church) was officially organized on December 15, 1944 under the pastoral leadership of Rev. Wallace Anderson. They were located at their present location on 726 State Street in Osage. The present facility was completed in 1963. The longest tenured pastor has been Rev. Rick Magstadt who served from 1983 to 2005. The present pastor, Rev. Jim Stern, along with his wife Anna, came in March, 2015 after serving in Hong Kong as missionaries and in Ottumwa, Iowa and Honolulu, Hawaii as senior pastor, all with the C&MA. The congregation is presently mobilizing itself to partner with other like-minded congregations to reach Mitchell County with the message of Jesus Christ. We do this in sharing Jesus both through the Word of God and through acts of kindness.